“The OnePlus One will be the fastest phone on the market. The OnePlus One will be unique to offer both the Qualcomm Snapdragon 801 as well as a full 3GB of RAM. I am very confident that everyone will see how impressive your phone experience can be with the One.” And now by looking at Oneplus One specifications, we do feel its the fastest phone ever. Oneplus is a completely new start-up smartphone developer company originating from Hong Kong, China. The founder of Oneplus Pete Lau first worked as Vice-President for Chinese smartphone maker Oppo. 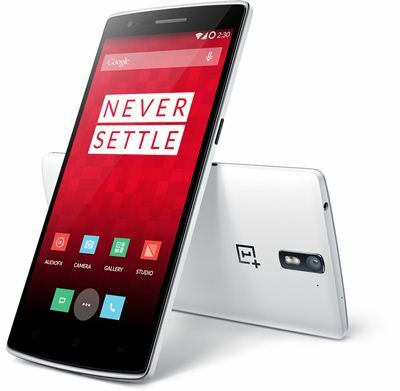 And Oneplus One is the first smartphone Oneplus has released on April 24, 2014 in Beijing. Since Oneplus is a Chinese company. You might expect Oneplus One to be a mediocre smartphone, with mediocre specs and design. But unlike this, Oneplus One has a hardware, software and design that would give Samsung Galaxy S5 a run for its money. Under the hood of Oneplus One is a beast, the Qualcomm Snapdragon 801 SoC. It is quad core SoC clocked at a whopping 2.5GHz, the same chipset is used in Samsung Galaxy S5 too. The GPU is Adrene 330 clocked at 578Mhz which allows for faster loading times for games and other graphic intensive programs. The phone has a 13 Mega Pixel rear camera consisting of Sony Exmor IMX214 6 lenses. Which basically means the camera piece contains 6 lenses, similar to what we’ve seen in Nokia Lumia 925. While the front camera has 5 Mega Pixel sensor, useful for selfies and video chatting. The Oneplus One has a large 5.5 inch full HD display with a resolution of 1920 X 1080. The display is developed by Sharp and includes its Adaptive Backlight Technology. The display is protected by Gorilla Glass 3 and has a pixel density of 401ppi. The phone comes with a whopping 3GB LPDDR3 (Low Power Double Data Rate) RAM. Only a few smartphones like Oppo Find 7 and Sony Xperia Z2. While the phone comes in 16GB and 64GB internal memory options. And no options for expandable memory. One the software front. The phone features Android Kitkat 4.4, which has been tastefully modified by CyanogenMod. CyanogenMod calls this customized version of Kitkat 4.4 as CyanogenMod 11S. CynogenMod and Oneplus have worked closely that goes along with the features of One. CyanogenMod 11S features flat UI design. Here’s a hands-on video of Oneplus One from Android Authority. You can see how Android Kitkat icons is pressed by CyanogenMod and created a flat UI design. The phone features a 3100mAh battery. The connectivity options include 4G LTE, Bluetooth 4.0, NFC and WiFi 802.11 a/b/g/n/ac. And the phone too weighs 168 grams, which Oneplus claims is the lightest 5.5 inch phone in the whole world. In a video released by Oneplus One. The video showcases the design process the phone went through. Watch the video released by the company. There is no word when the phone will be released in India. But in Q2 the phone will be launched in countries like US, UK, Belgium, Canada, Denmark, Austria, Finland, France, Hong Kong, Italy, Netherlands, Germany, Portugal, Spain, Sweden and Taiwan.